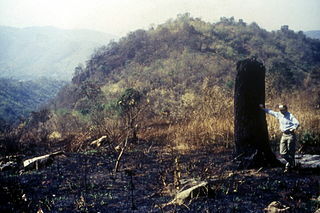 Damaged forest at Doi Suthep-Pui National Park, Thailand, awaiting restoration. LONDON, Aug. 22, 2016 – The ecological and carbon cost of rainforest destruction goes on accumulating for years after nations halt the conversion of canopy into farmland, scientists have found. This implies that to meet ambitious targets, global strategies to combat climate change – including forest restoration – should have started years ago. Tropical forests soak up vast quantities of carbon dioxide released by industrial combustion of fossil fuels, limiting global warming. Burning, clear-felling and ploughing of forest lands release centuries of stored carbon back into the atmosphere to accelerate global warming and climate change. So forest conservation and carbon emissions reduction are both vital parts of any strategies to contain global temperature rises. Researchers report in the journal Current Biology that they looked at the history of forest clearance in the tropics to work out the ups and downs of the forest carbon budget and estimate the loss of species that make the rainforests their home. “We show that even if deforestation had completely halted in 2010, time lags ensured there would still be a carbon emissions debt equivalent to five to ten years of global deforestation and an extinction debt of more than 140 bird, mammal, and amphibian forest-specific species, which, if paid, would increase the number of 20th century extinctions in these groups by 120%,” says Isabel Rosa of Imperial College, London, who led the study. The research is a restatement of the message from other studies of the relationship between the forests, the atmosphere, the species that depend on forest ecosystems and the likely trajectory of climate change. Scientists have warned, more than once, that destruction of the great rainforests invites catastrophic climate change. They have also warned that rising global average temperatures, and consequent shifts in climate patterns, can accelerate the process: drought can turn a rainforest into a carbon emitter rather than a carbon sink. The scientists report that they estimated the annual rates and spatial patterns of deforestation from 1950 to 2009 in the Amazon basin, the Congo, and southeast Asia. They then did the sums to calculate the carbon emissions that followed clearance, and the toll such action takes on citizens of the forest. This revealed a total of 144 extinctions of vertebrate species that exist only in the tropical forests. “We need to do more if we want to avoid paying these debts, thus preventing further loss of species and carbon emissions,” Dr Rosa said. “We need to preserve existing habitats, but also restore forests that have been degraded. If animal extinctions are a measure of forest loss, studies of forest species could also deliver a measure of the success of forest restoration, according to a separate study. British and Australian researchers report in the Journal of Applied Ecology that they tested the proposition that restoration of a forest could enable animal communities to recover. They set traps and caught 3,317 dung beetles in 12 different places where forests were being restored – some begun two years earlier, some 17 years earlier – and compared their catches with four rainforest sites and four degraded pasture sites in Australia’s moist tropics. They found that where native tree species had been replanted, dung beetle communities and their roles in the ecosystem showed signs of recovery. But the scientists warn that the true measure of recovery is not a simple index of animal numbers and variety. What matters most is the functions they perform. Diversity alone is not enough to answer the important questions. “Traditional identification methods do not capture these complexities and so could potentially misjudge the true response of biodiversity and functioning to land use change, disturbance and ecological restoration,” said Mia Derhé of Lancaster University in the UK, who led the study.